We’ re super happy to welcome Mingue to Dox! After working successfully with DJs such as EDX, Bolier and Zonderling, Rotterdam singer Mingue’s solo EP will appear this autumn on Dox Records. The EP Almost Midnight is produced by Dutch producer BRÅVO. Together they have created six light, fresh tracks on themes such as love, guilt, freedom and hope. The first single Paradise is out now. It’s been years since this remarkable duo worked together on Mingue’s (then Ming’s Pretty Heroes) very first album. While singer Mingue ventured into the world of electronic beats with leading DJs such as EDX (Missing) and Bolier (Riverbank), electro-pop producer BRÅVO issued his own releases (Why I Don’t Feel You, The Calling). In this new record, they have rejoined to create Paradise. 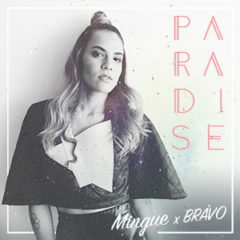 In Paradise, BRÅVO’s signature sound of electronic beats and old school synths support Mingue’s playful vocals. The track is all about escaping from the daily grind and the temptation to run away and leave it all behind. New tracks by Mingue will be released in the coming months, leading up to the release of her new EP, Almost Midnight. Paradise is now available on all streaming and download services.